Pursuit uses Elementor, the ultimate live page builder for WordPress. Go beyond the oversimplified and generic page designs, by having more control over the various sections. Elementor's page sections make up the basic architecture of the page, and allow you to reach a level of design reserved until now for high budget custom designed websites. With Elementor, you can decide to position the column to the top, center, and bottom of a section, or stretch it out to the whole section. You can also position the content within the column in the same manner. This unique feature gives you the freedom to create a design that is much more customized. Set the padding & margin for sections, columns & widgets, using px, EM or %. This feature is unique to Elementor. Without using % or EM, the heading you set may end up looking huge in mobile. Our dynamic size settings let you take full advantage of the various scaling possibilities. Change the gaps between columns in order to let your design breathe. By changing the gaps at once, you can try out different column layouts, and visually decide which one has the best fit. This setting is amazingly simple to customize, but makes a huge difference on the ending result. Design it. Save it. Reuse it. Create your own or jumpstart from any of the 25+ beautifully crafted, tech startup page templates. Save and reuse your designs anywhere on your website. Instead of starting from scratch, use our pre-designed templates to jumpstart your design process or get inspired. 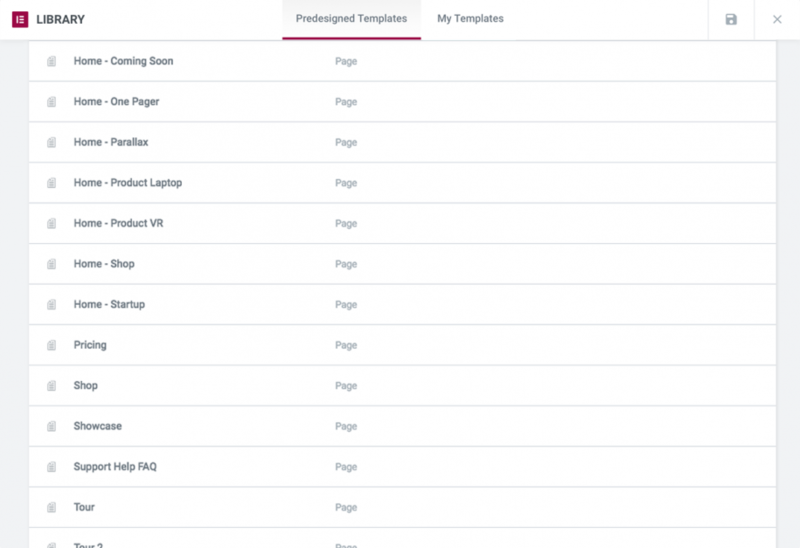 Save your page designs as templates, and reuse them on other pages. This can really speed up your workflow. Pursuit with Elementor gives you a complete package of 40+ widgets. Pursuit includes premium tech startup widgets like feature bar, call to action, conversion form and many others. 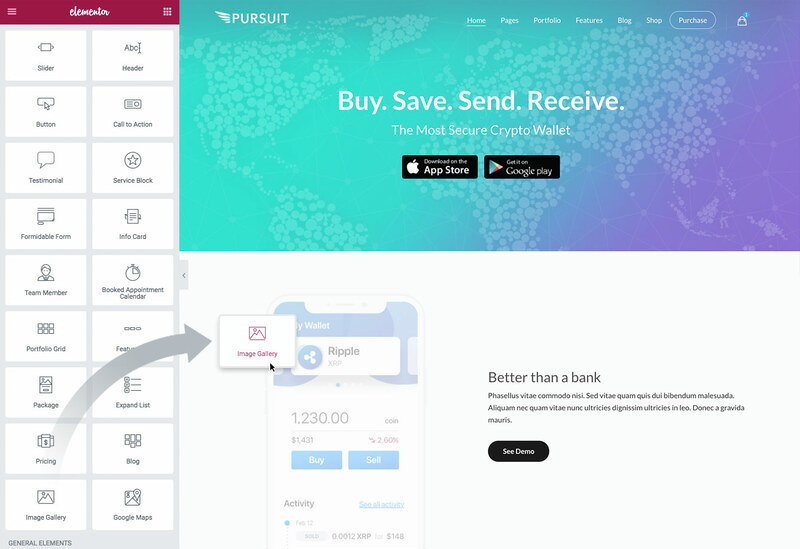 Pursuit includes many useful widgets specific for Cryptocurrency. All widgets are custom made to work inside the live page builder. Include your favorite plugins and WordPress widgets automatically, and simply drag and drop them into the page. No need to do any coding whatsoever. 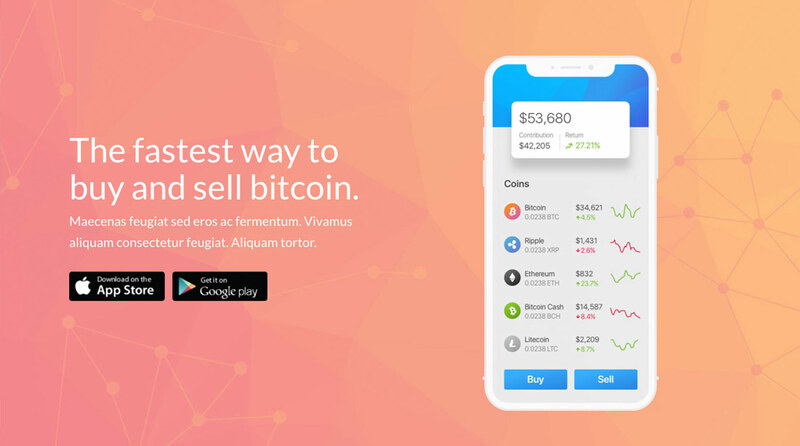 You get immediate access to over 40 widgets (including Pursuit premium widgets) that help you create the perfect cryptocurrency exchange, ICO, digital wallet, bitcoin or fintech startup website with limitless possibilities. Select your own colors, gradients, overlays and opacity using slider controls and color pickers for total control and speed. The term 'responsive design' has been worn out, but Pursuit with Elementor lives up to the promise, with device preview screens, percentage based element widths and device visibility control. Pursuit with Elementor offers developers the freedom to customize and extend it and can become a useful plugin for developers that don’t want to be chained to a theme. Elementor is based on the most recommended coding standards, making your pages SEO optimized out of the box. Check out Pursuit and the live page builder.